The Common Crane (Grus grus), also known as the Eurasian Crane, is a bird of the family Gruidae, the cranes. 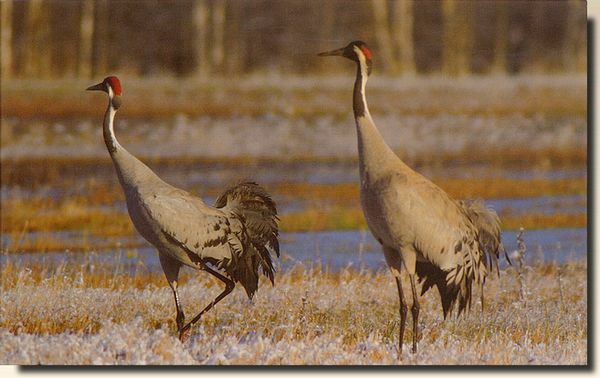 It is a large, stately bird and a medium-sized crane at 100-130 cm (40-52 in) long, with a 180-240 cm (71-96 in) wingspan and a weight of 4.5-6 kg (10-13.2 lbs). It is grey with a white facial streak and a bunch of black wing plumes. Adults have a red crown patch. It has a loud trumpeting call, given in flight and display. It has a dancing display, leaping with wings uplifted.